I’m 28, and I’ve been doing my own laundry for well over 10 years. Turns out I've been washing my white shirts wrong. I’m no laundry rookie, but after speaking with the lovely founders at The Laundress, I learned I’ve been skipping a very important step when it comes to laundering white T-shirts. “Stay away from chlorine bleach and don’t skip the underarm pre-treatment before washing. Whether you are prone to sweating or not, the underarm area is susceptible to yellow discoloration with every wear. Make sure to follow these steps to keep white T-shirts from looking old and dingy,” Lindsey Boyd and Gwen Whiting explained. 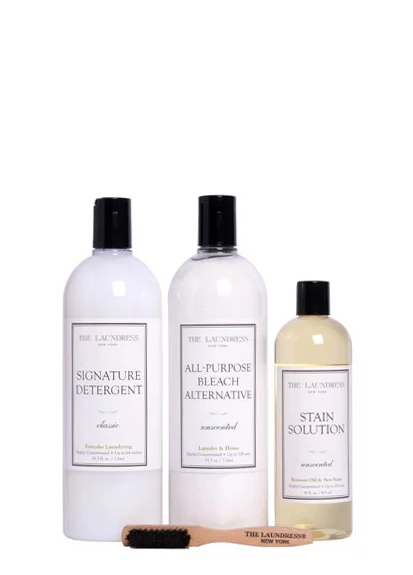 As someone who wears a lot of white tees, I’m taking this tip straight to my next load of laundry and purchasing the below Pip Kit so I can pre-treat my tees and give them the extra cleaning care they deserve. This simple tip will also extend the life of your white shirts by avoiding soiled pit marks for a longer period of time. For more laundry tricks, read about the dos and don’ts of washing your leggings and how to wash your jeans the right way. For now, scroll down to shop the kit you need to ensure your white T-shirts are kept in pristine condition, and browse our favorite assortment of new tees at the end. Up next, shop every "boring" basic you'll need in 2019.